Where on the Temple Mount exactly was the Temple? Dr. Reagan: Some people have argued that according to ancient manuscripts the priests stood on the steps of the Temple, looked over the Eastern Gate to the pinnacle of the Mount of Olives, and watched the sacrifice of the red heifer. They conclude therefore that the Temple has to be located up to the north and can be built without touching the Dome of the Rock. What do you have to say about all of that? Dr. Fleming: Alright, good question. Not only is the sacrifice of the red heifer mentioned but also the Day of Anointment with the scapegoat. The priest's assistant takes the goat out the Eastern Gate and goes up to the Mount of Olives to a point where he can look back from the Mount of Olives into the Holy of Holies, meaning the door of the Temple is left open and the back of the curtain in the far west side of the Temple. As he confesses the sins of the people on the head of the goat his eyes are looking to the symbolic presence of God in the Holy of Holies. This made some wonder if that needed to be a straight line from the Temple and the Holy of Holies to the Mount of Olives. The tractate about this is called Kippurim, meaning a collection of Jewish rules about the Feast. It was oral law codified in the Second Century AD. Kippurim is the plural for Kippur — the Day of Atonement — and it says that the priest was high enough on the Mount of Olives to look over the Eastern Gate. The wall then was relatively low and we see how high is enough. This you understand would not prove or disprove where the Temple was because the priest is not looking through the gate as he is looking over the gate. So, we still have some uncertainty. What has been found is an excavation in the 1880's by a British explorer named Warren. He dug a well after getting permission from the Turks and came to point up under the cemetery. He found 46 feet out from the eastern wall another wall that then curves in. He followed that wall showing that it was a part of a way of coming up to the Eastern Gate. It was such a steep slope probably having another lower gate. He only excavated a little section though. And so, it seems to have been a retaining wall outside the Temple Wall because it was so steep. Dr. Reagan: What would this have to do with the location of the Temple? Dr. Fleming: It has do with the way one got to the Temple. The Mount of Olives was due east of Jerusalem. The Messiah will come from the east, plant His feet on the Mount of Olives, and enter Jerusalem. Jesus entered Jerusalem from the east on Palm Sunday. Jews want to be buried on the east side of the city to be near where the Messiah will come. Many have wondered if Jesus enter through the Eastern Gate. The New Testament doesn't help us with the answer. It says at that point he descended the Mount of Olives and entered the Temple. There were two main entrances to the Temple in the southern wall called the Hulda Gates. The main written sources say they served as the main entrance. The Eastern Gate was used for ceremonial purposes on the Day of Atonement and for the red heifer ceremony as the causeway. Dr. Reagan: Was the Eastern Gate in front of the Temple? Dr. Fleming: We don't know. If it was, the Temple may have been further north, but we cannot know for sure. I think that it was very important for the Romans after they destroyed Jerusalem to show that their Roman god was greater then the Jewish God, so they put the temple they built to honor Jupiter exactly on top of where the Jewish Temple was, and it was. That temple was destroyed by the Christians later and then the site was left to ruin. There is evidence that the Roman temple lasted from 135 AD to the Fourth Century AD and that some of the lines we see up on the Temple Mount do seem to be over where the Dome of the Rock is now. Dr. Reagan: Your best guess at this point is that the ancient Temple was located where the Dome of the Rock is located? Dr. Fleming: Ancient wars were not only wars between armies, they were wars between gods. You've got to show that your god is greater than their god. Dr. Reagan: The problem we have today is that the Muslims really have control of the Temple Mount. It is under Israeli sovereignty, but the Israeli's turned it over to them. When you go up there you have to go through Muslim guards and you have to obey Muslim rules. For example, when you are walking around the Temple Mount, I can't touch my wife's hand. I can't pull out a Bible and read. I can't pray because they will not tolerate it. So, they will not tolerate archaeological excavations up there? Dr. Fleming: Correct, we can't dig to find out for sure where the Temple was located. Wouldn't it be great if there was that kind of tolerance that Jesus spoke about, speaking about Isaiah, "My house should be called a house of prayer for all men." Dr. Reagan: Let me ask you something else. 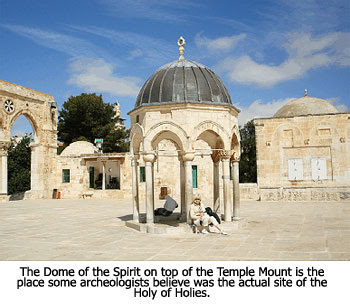 There is a very small cupola on the Temple Mount called the Dome of the Spirit. It has the only outcropping I think of the bedrock right there and it is smoothed off. Many think that may have been the location of the Holy of Holies. What do you think it was? Dr. Fleming: It is hard to say. There is bedrock of course exposed inside. Here is the reason that I am cautious. When the Temple is described by Josephus he says it had courtyards on four sides. He said the Eastern Court was the largest, the Southern Court was the next largest, the Northern Court the next, and the Western Court was so small it served no purpose. The cupola is just so far north that it makes many wonder if it still fits being in the third largest court yard. It just seems like it is so out of center to have it that much further north. Herod added both on the southwest and north when he built the Temple courtyards, but in summary (and I know people don't like that uncertainty) we have to have some caution here. The Romans dug up the very foundation of the Temple, again to make a political and religious statement. In fact, they were probably looting for the gold of the Temple that made the saying of Jesus literally true, that not one stone would be left standing on another (Matt. 24:2; Mk. 13:2; Lk. 21:6). That makes it hard for the archaeologist of 2,000 years later to be able to have stuff to look at. Dr. Reagan: On the east side of the Temple Mount there can be no excavations because of the Muslim cemetery. In 1967, when the Israeli's regained Jerusalem, one of the first things they started doing was excavating the south end. They found remarkable things there. One of the most remarkable discovery to me is the huge mikvah. It is a massive thing. On the Day of Pentecost, 3,000 people responded and Peter baptized them. Dr. Fleming: There are three dozen baptistery areas in that one building. Dr. Reagan: Peter didn't march them down to the Jordan River. No, he could have stepped right down here and baptized them at the mikvah. Dr. Reagan: On one side is what American's call the Wailing Wall or the Western Wall. But, only a portion of it is revealed. Around it are houses that make it difficult to do any excavations? Dr. Fleming: Yes. Outside the Temple Mount there are buildings. Unfortunately, there have been Muslim excavations in a few places inside the Temple Mount to do with pipes and stuff like that. We found where their dump was, and all the debris from that dump is now being scientifically analyzed by Gabi Barkai, an Israeli archaeologist. 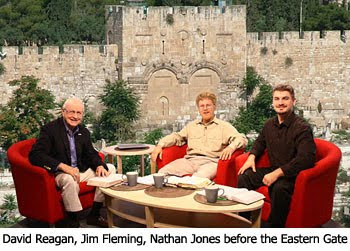 Dr. Reagan: I have another question for you and that is in many, many, many drawings I have seen of the Ancient Temple at the time of Jesus, they show a bridge going across the Kidron Valley from the Mount of Olives to the Eastern Gate. Is there any archaeological evidence that such a bridge existed? Dr. Fleming: No. The written sources say that the priest went across the causeway of the scapegoat and the causeway of the red heifer. That is because the Mount of Olives has tombs and the priest did not want to be defiled going by a tomb. This would have been a wooden boardwalk temporarily constructed for the tomb, and not a formal bridge. Those who made those maps didn't notice the details that said it was temporarily constructed and then taken down. I have an old video tape of the Temple that has been modelled to scale (20ftx12ft) by 76 year old Alec Garrard a Norfolk farmer in the UK. He has spent thirty years building it and he has thoroughly researched it. He is convinced that it stood where the Dome now stands and contradicts the Northern end of the mount; something to do with the overflows, and cisterns that took away the blood and water from the sacrifices. It is considered to be world class and has visitors from around the world to see it - and he is STILL adding to it. I shall fish it out and have a gander again this weekend. It’s bound to be in DVD by now I should think. It is in today’s Telegraph. I have 'The Temple' by Alfred Ederssheim. He maintains the walkway was laid atop of a series of tall arches spanning the Kidron to ensure it all remained ceremonily clean and separate from the tombs below. First they killed the red heiffer on the Mt of Olives, burnt it to ashes, carried them over the arched causeway to sprinkle onto the water cisterns for purification so the cleansing of the priests and the area could be prepared for the start of the sacrifices. The Temple Institute has a series of interesting videos on this subject, for example see the one on the Red Heifer. Additionally, Karen Boren wrote a book about this ceremony in The Messiah of the Winepress.